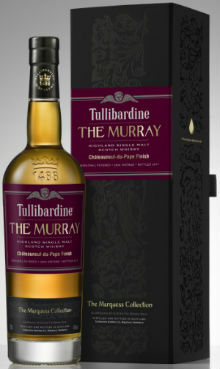 Following swiftly on the heels of the second addition to Tullibardine’s Marquess Collection, The Murray 2005 (reviewed here), a third instalment has been announced. The first two expressions were both matured entirely in first fill ex-bourbon casks for around 12 years before being bottled at cask strength. This third expression has also been matured for around 12 years (it’s also a 2005 vintage) in first fill ex-bourbon casks, followed by a finishing period in wine barriques from Châteauneuf-du-Pape in France’s southern Rhône vineyards and bottled at 46%. Nose: Damp, dusty wood, sundried tomatoes, dry leather and old baking spices. There is some fruit with raspberry compote, apricots and cherry loaf. Palate: Very grippy tannins, with some sulphur notes, wet logs, musty, damp earth and cracked black peppercorns. There’s a little ‘red’ sweetness – cherry lips sweets and Bakewell Tarts – but only just. Finish: Drying oak, cinnamon, and Campino sweets. Overall: Hmmm… it’s all very heavy, woody, and spicy with not too much in the way of fruit or spirit-derived influence. I’m not sure how long the whisky spent in those Châteauneuf-du-Pape casks, but it’s a bit too long in my opinion. The liquid is dominated by these casks to the extent that there’s only a trace of light fruit to give it a hint of complexity. The previous two expressions in the Marquess Collection were much tastier, which is perhaps that’s a reflection on this spirit’s (in)ability to work with heavy wood influences? Tullibardine in bourbon casks works much better, to be honest. And there’s much better whisky out there to spend £50 on. This entry was posted	on Tuesday, May 22nd, 2018 at 8:38 am	and is filed under Reviews. You can follow any responses to this entry through the RSS 2.0 feed. You can leave a response, or trackback from your own site. You’re wrong about this. It is a cracking dram. Thanks for your comment, even if you disagree with me! That’s the beauty of whisky; the subjective nature of it, and I’m glad you enjoyed this dram.